Do you want to protect your workbooks from unexpected computer crashes or power failures? This article explains how to recover unsaved files and restore previous versions of your workbook in Excel 2016, 2013, and 2010. You'll also learn different ways of file backup on your PC or in the cloud. Just imagine that you have been working on a very important document in Excel for some hours, creating a very complicated graph, and then… oops! Excel crashed, the power went out or you accidentally closed a file without saving. That is frustrating, but don't be so cut up about it - you can easily recover your unsaved document. What is the worst that could be? While working on a workbook you found out that you made a mistake about an hour ago, you already made a lot of changes since that time and undo is not an option. If you want to know how to retrieve an overwritten Excel file, go ahead and read this article. Excel provides us with such good features as AutoSave and AutoRecover. If they are enabled, it won't be a problem for you to recover unsaved files and restore previous versions in Excel 2016 - 2010. But these two features are often misunderstood, so at first let's define what they mean. Excel AutoSave is a tool that automatically saves a new document that you've just created, but haven't saved yet. It helps you not to lose important data in case of a computer crash or power failure. Excel AutoRecover helps you retrieve unsaved files after an accidental closure or crash. 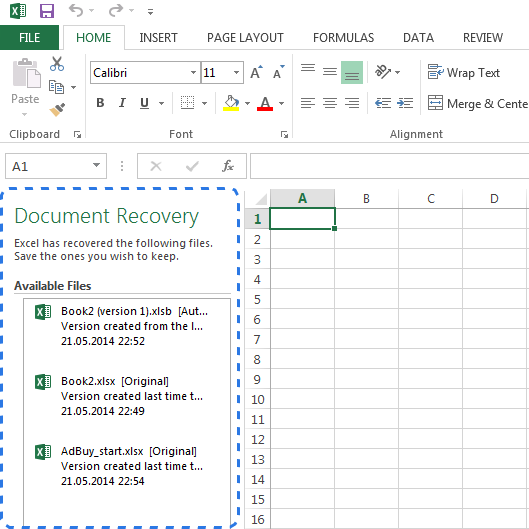 It allows you to restore to the last saved version which displays in the Document Recovery pane when you start Excel next time. Note. 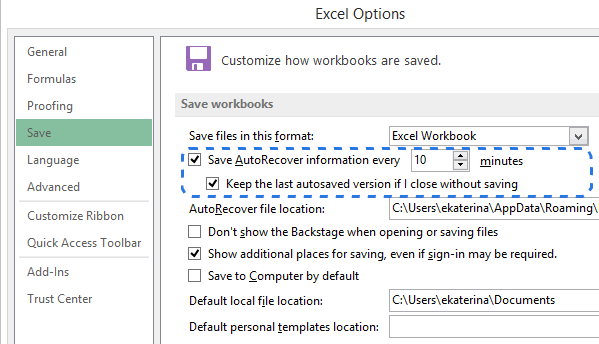 The AutoRecover feature only works on Excel workbooks that have been saved at least once. If you never save a document before a computer crash, the Document Recovery pane won't show up in Excel. Luckily, the options to auto save and auto recover files are turned on in Excel by default. If you are not sure, you can easily check them up. Click Save on the left-hand pane of the Excel Options dialog. Make sure that both Save AutoRecover information every X minutes and Keep the last autosaved version if I close without saving are checked. By default the AutoRecover feature is set to automatically save changes to your workbook every 10 minutes. You can shorten or lengthen this interval as you like. Here you can also change Excel AutoRecover file location and specify AutoRecover exceptions. Tip. If you want to be more secure in case of a crash or electricity failure, you should lower the time interval for saving information. The more frequently the document is saved, the more versions you have, the more chances to get all the changes back. Now when Excel is configured to auto save and auto recover your documents, you will easily restore a file when something goes wrong. Further in this article you'll find out how to recover new files that you've just created and the ones that you've already saved. Suppose you are working on a new document in Excel and the program locks up unexpectedly. In a few seconds you realize that you didn't save the workbook. Don't panic and discover below how to recover an unsaved file. 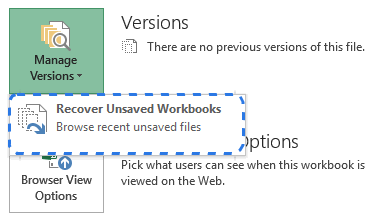 Scroll down and click on the Recover Unsaved Workbooks button at the bottom of the list. Note. 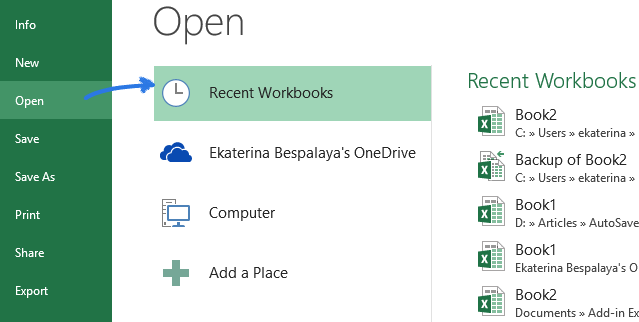 You can also go to FILE - > Info, open the Manage Workbooks drop-down and select Recover Unsaved Workbooks from the menu. When the Open dialog box pops up, just select the necessary file and click Open. The document will open in Excel and the program will prompt you to save it. Click on the Save As button in the yellow bar above your worksheet and save the file to the desired location. Click on the FILE tab and choose Info on the left-hand pane. Next to the Manage Versions button you'll see all autosaved versions of your document. Excel automatically saves versions of the workbook at specified intervals, but only if you've made changes to your spreadsheet between these intervals. The name of each version has a date, time and the "(autosave)" note. 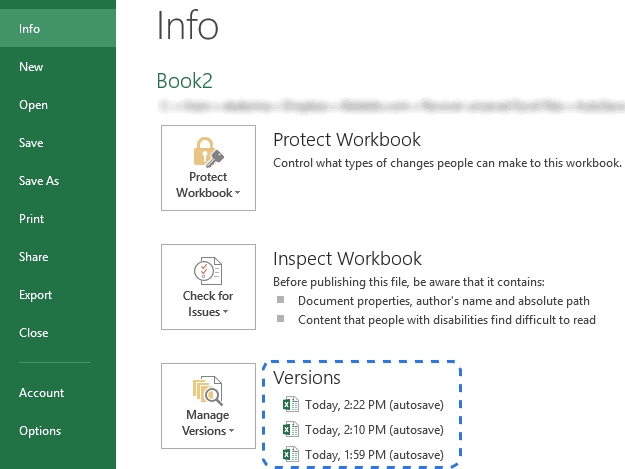 When you click any of them, it will open along with the most current version of your workbook so that you can compare them and see all the changes. If the program closed incorrectly, the last autosaved file is labeled with the words (when I closed without saving). When you open this file in Excel, you'll get the message above your worksheet. Just click on the Restore button in the yellow bar to revert to the newer unsaved version of the workbook. Note. Excel deletes all previously autosaved versions when you close the document. If you want to look at the previous version again, it is better to create a backup copy of your data. Excel's Auto Backup is a very useful feature that can help you retrieve a previously saved version of your workbook. Saving a backup copy can protect your work if you accidentally save changes that you do not want to keep or delete the original file. As a result, you will have the current saved information in the original workbook and all previously saved information in the backup copy. Go to FILE - > Save As. Select Computer and click on the Browse button. When the Save As dialog window pops up, click on the small arrow next to the Tools button at the bottom of the window. Select General Options… from the drop-down list. 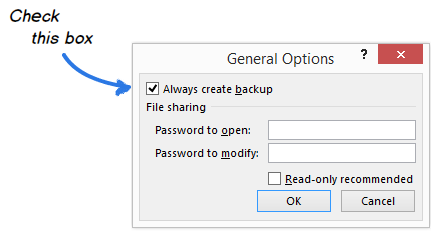 Check the Always create backup box in the General Options dialog and click OK.
Now you can rename your file and choose the desired location to save it. Excel will create a backup copy of the document in the same folder. Note. A backed up copy is saved with different .xlk file extension. When you open it, Excel will ask you to verify that you really want to open this workbook. Just click Yes and you can restore a previous version of your spreadsheet. Now you know how to enable the Excel Auto Backup option. However, every time you save a workbook, a new backup copy will replace the existing one. How can you get back to the earlier version if you've already saved the document several times? Take it easy - you have at least two ways out from this situation. The first one is to use ASAP Utilities. They offer the Save file and create backup tool that helps you create multiple backup versions of your document. Once you install these utilities in Excel, you can use a special keyboard shortcut to save your workbook and automatically create a backup copy. Each version has a timestamp in the file name, so you can easily find the necessary copy according to the date and time it was created. If you are comfortable with VBA, you can use a special Excel AutoSave macro to backup your files. Just copy it from this article and paste into the code Module. You can create as many backup copies as you want just by pressing a simple shortcut. It will restore a previously saved version of your workbook and won't overwrite any old backup file. Each copy is marked with a date and time of backup. For those who use cloud storage services for saving their docs, retrieving overwritten Excel files won't be a problem at all. Let's have a closer look at OneDrive, Microsoft's storage option. Its biggest strength is that OneDrive is closely tied with Office. 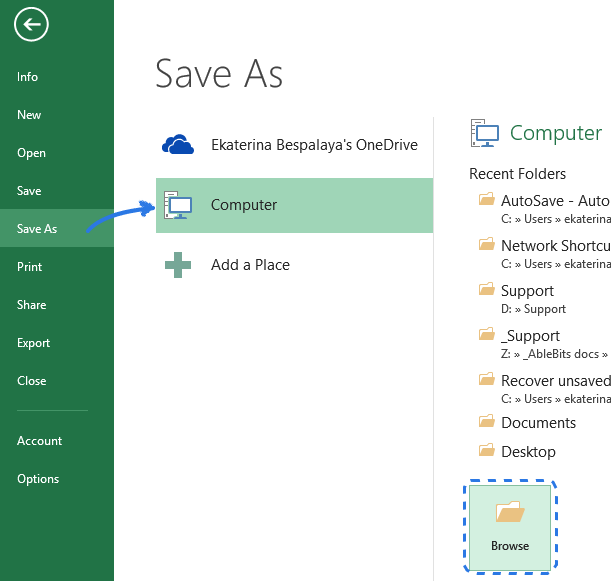 As an example, you can quickly open and save OneDrive documents right from your Excel. OneDrive and Excel work together to sync workbooks faster and let you work with other people on shared documents at the same time. When you or your colleague makes changes to a document, OneDrive keeps track of the versions automatically, so you don't need to store multiple copies of the same document. With OneDrive's Version history you'll be able to see the earlier variants of the file, you'll know when the document was modified and who made the changes. You can also restore any of the previous versions if necessary. Another very popular cloud storage service is Dropbox. It keeps snapshots of every change in your Dropbox folder over the last 30 days. So even if you saved a bad change, or if the file has been damaged or deleted, you can restore the document to an older version with only a few clicks. Dropbox doesn't work so closely with Microsoft Office as OneDrive, but it is so simple that everybody can master it. Now you know different ways to recover unsaved files and create a backup copy of your workbook in Excel 2010, 2013 and 2016. And I hope you won't push the panic button next time when your computer crashes or power goes out. 118 Responses to "How to recover unsaved Excel file or restore its previous version"
how do I perform auto recovery for an unsaved file on excel running on MAC HIGH SIERRA? Please help. Is it possible to get last updated excel File? If yes, then please let me know the process. Actually I have updated excel file on 30th Nov18 and the same file overwritten on 4th Dec18 and closed. Now I need 30th Nov18 updated file. Can someone help me out. the manage versions does not show any other versions and when going to the folder of recovered files, its empty . Why this is so? Also though I had already checked auto recover every 10 minutes and auto save if I close file without saving option, I still could not recover my 10 minutes old file and got 3 hours old version instead :( Wanted to know why this happened. Thank you!!!! I thought I had had all the options and that I had to do a whole-day administrative task all over again, but I continued searching a little more, found your tip to get to the AutoRecovery location and found all my work back!! !